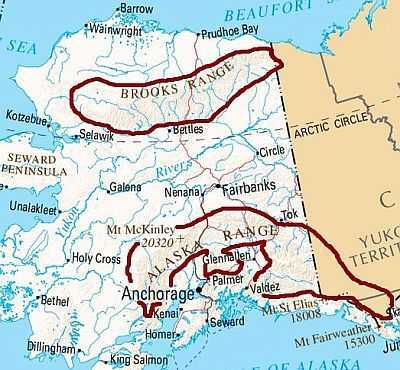 Alaska, the largest state of the United States with a surface of more than 1.7 million square kilometers (650,000 square miles), largely deserves its reputation of a cold land, but it has also maritime and wet areas, which are not as cold as you might think. The north and northwest coasts have a subarctic climate, with long, frigid winters and very cool to cold summers. This is the area of the tundra. Along the northern and the north-west side, down to the Bering Strait, temperatures are very low, especially in winter, both because of the high latitude and because the sea remains frozen for many months. In addition, this area is influenced by the Siberian air masses, which can easily arrive in this area, moving from west to east. At Point Hope, on the north-western tip of Alaska, the daily average temperature ranges from -23 °C (-9.5 °F) in February (which at these latitudes is the coldest month) to 7.5 °C (45.5 °F) in July. On the north coast, in Point Barrow (or Nuvuk), the average temperature ranges from -25.5 °C (-13.5 °F) in February to 5 °C (41 °C) in July, while further to the east, in Barter Island, it ranges from -28.5 °C (-19.5 °F) in February to 5 °C (41 °F) in July. Here are the average temperatures of Barrow. In this coastal area, precipitation occurs mostly in the form of snow, except in summer, and it is scarce, in fact, it is slightly higher than 300 millimeters (12 inches) per year in the western part and even scarcer, just above 100 mm (4 in), on the north coast. Here is the average precipitation in Barrow. In Barrow, the sun remains below the horizon for a couple of months, from November 18 to January 22, while it never sets from May 10 to August 2. In late spring and in summer, the sun is seen for a good number of hours, also because of the very long days. However, in this period, in addition to rainy days, sometimes fog can form. On the north coast, the sea is frozen solid for many months every year. Remember that the sea freezes at about -2 °C (28 °F). Along the west coast, as you move south, both temperature and precipitation increase. In Nome, the average temperature is between -15 °C (5 °F) in January and 11 °C (52 °F) in July. Precipitation in Nome amounts to 430 mm (17 inches) per year, with a minimum in spring and a maximum in summer. Here is the average precipitation. Since it is located to the south of the Arctic Circle, in Nome the sun rises even in winter, but the days are short and the sun is rarely seen. In summer, the days are not as long as in Barrow, but approximately from May 18 to July 26, there are the "white nights", that is, when the sunset lights remain even at midnight. However, in summer, both because of the shorter days and the more frequent rains, the sun shines for a lower number of hours than on the north coast. In the western part of the coast, from December to April the sea is near the freezing point, so in colder periods it can freeze, while the water temperature reaches 10 °C (50 °F) in August. More to the south, the winter climate is less cold, while summer is still very cool, in fact, the average in July and August remains around 10 °C (50 °F). In Cape Newenham, the temperature is around -8.5 °C (16.5 °F) in January and 10 °C (50 °F) in July. Precipitation amounts to 930 mm (36.5 inches) per year, with a minimum between February and April and a maximum between July and October. Snow totals 2 meters (6.5 feet) per year, and usually falls from October to May. The Alaska Peninsula lies further to the south, so it has a milder winter, but the summer is still cold, so the vegetation is still tundra, that is, made of mosses and lichens. In Cold Bay, the average temperature is -2.5 °C (27.5 °F) in February and 11 °C (51.5 °F) in August. Here are the average temperatures. Precipitation in Cold Bay amounts to 900 mm (36 inches) per annum. Here is the average precipitation. In the central and western part of the Alaska Peninsula, typically the sea does not freeze in winter, but sometimes it can do it, at least on the north coast and during the coldest winters. Here is the sea temperature in Cold Bay (which is located on the south coast). The Aleutian Islands are even milder, but they still have tundra vegetation because of their cold maritime climate, which is similar to that of Iceland. So, the climate here is cold but not too much in winter, with averages around -2/0 °C (28/32 °F) in the winter months, and very cool in summer, when the maximum temperatures are similar to those of Cold Bay, around 12/13 °C (55/56 °F). Precipitation is frequent throughout the year, but especially in autumn. During winter, heavy snowfalls occur. The vast interior region of Alaska has a markedly continental climate, with frigid winters, and short but mild summers, during which there can be a few hot days. Here the dominant vegetation is taiga (coniferous forest). 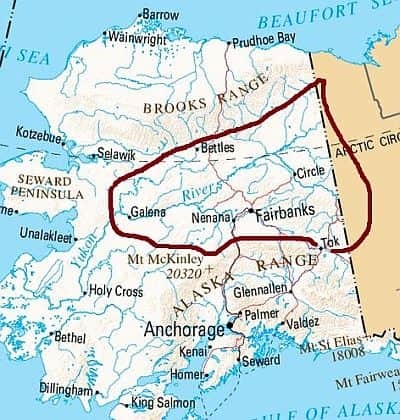 The cold records of Alaska (which contend with some areas of Canada those of the entire north American continent) have been set in this area, and in particular in the valleys of the Yukon River and its tributaries, where cold air during winter easily stagnates, especially after cold air outbreaks from Siberia or the North Pole. The temperature reached as low as -62 °C (-80 °F) in Prospect Creek, -59 °C (-74 °F) in McGrath and Chandalar Lake, -57 °C (-71 °F) in Eagle and Tetlin, -56 °C (-69 °F) in Arctic Village and Bettles, and -52 °C (-62 °F) in Fairbanks. Apart from the records, as mentioned above, the climate of this region is strongly continental, so much so that in winter, lows around -30 °C (-22 °F) are normal, while in summer, from June to August, highs are usually around 20/22 °C (68/72 °F), but with peaks of more than 30 °C (86 °F). Nights remain generally cool, and sometimes they can be cold. It may seem incredible, but in central Alaska, sometimes the temperature can reach 35 °C (95 °F)! In this area, the temperature rises above the freezing point around late April and drops again below it in October. Here are the average temperatures of Fairbanks, the second largest city in Alaska, located in the center of the state. Precipitation in this area is not abundant, in fact, it ranges from 250 to 350 mm (10 to 13.5 inches) per year, with a relative maximum in summer due to the higher amount of heat, and therefore energy, available during this period. Here is the average precipitation in Fairbanks. In inland areas, the sun shines more often than on the coast; from April to June in Fairbanks there are as high as 10/11 hours of sunshine per day. However, in late spring and summer, the days are very long because the city is located just south of the Polar Circle. Moreover, since the time zone is shifted two hours compared to the real meridian, on 21 June, the longest day of the year, the sun sets after midnight, at 12.47 in the morning, while it rises two hours later, at 2.57 a.m. The white nights occur roughly from April 25 to August 17. In the mountain regions, we find glaciers and permanent snow. The Alaska Range reaches its peak in Mount McKinley, towering with its 6,194 meters (20,321 feet). On the mountain slopes exposed to moist winds coming from the sea, every year large amounts of snow accumulate. Owing to both the facts that snowfalls are heavy and summers are cool, the snowline is very low, and in some areas, the glaciers, which tend to slide slowly downward because of their weight, flow even into the sea. Let us now talk about the south coast of Alaska. Here, both the climate and the natural environment are similar to those of the west coast of Norway. In fact, here too a warm current flows in the sea, so much so that the water temperature doesn't drop below 6 °C (43 °F) even in winter. Therefore, the climate is cold maritime, with abundant rainfall (and snowfall in winter as well) on the coasts. In addition, here too there are islands (see the Kodiak and Alexander Archipelagos), fjords and deep coves, within which the climate is somewhat more continental and less humid. 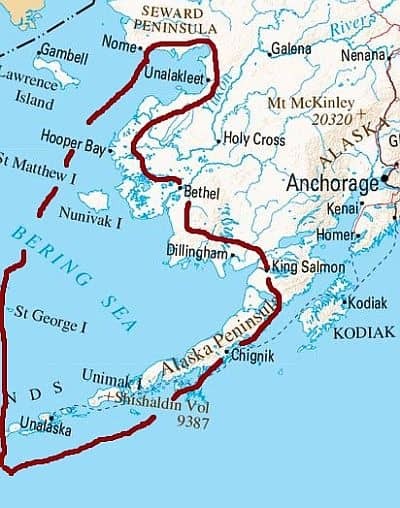 Anchorage is located in a sheltered bay, so much so that precipitation amounts to only 425 millimeters (17 inches) per year. Snow falls from October to April, and despite the low level of precipitation, the total amount of snow that falls in a year is close to 2 meters (6.5 feet). Here is the average precipitation. The daily average temperature ranges from -9 °C (16 °F) in January (like in Moscow, Russia) to 16 °C (60.5 °F) in July. Here are the average temperatures. 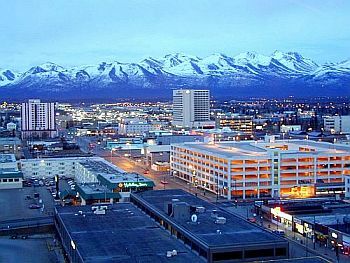 In Anchorage, the sun shines quite often in spring and summer. However, during this period the days are very long, and roughly from May 7 to August 5 there are white nights. Near Anchorage, and along the southern coast of Alaska, the sea is cold in winter but does not freeze. Further east, and south of the Wrangell Mountains, Valdez is famous for being a very snowy city; in fact, up to 835 cm (27 feet) of snow fall per year. In the winter of 1989-1990, a total of 14 meters (46 feet) of snow was recorded! The snow is shoveled and piled in heaps as high as houses, which can last until July. Here the average temperature in January is -6 °C (21 °F), while in July it's 13 °C (55.5 °F). Precipitation amounts to 1,700 mm (67 inches) per year, evenly distributed, but with a relative minimum in May and June. 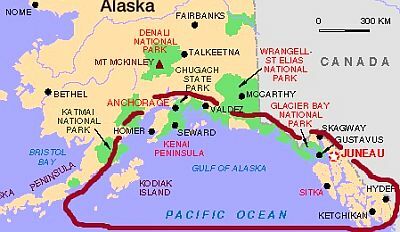 In southeastern Alaska, west of the Canadian province of British Columbia, lies the state capital of Alaska, Juneau. Here winters are cold, in fact, the January average is -2.5 °C (27.5 °F). Summers are cool, with highs in July of only 18 °C (64 °F). Here are the average temperatures. In Juneau, precipitation is abundant, in fact, it is about 1,600 mm (62 inches) per year, with a peak from August to December. Snowfalls are abundant and occur from late October to early April, totaling 2.2 meters (86 inches) per year. Here is the average precipitation. In Juneau, the amount of sunshine is not great, since the rains are frequent; nevertheless, the sunniest season, albeit slightly, is spring. March and April are the sunniest months, while September, October, and November are the cloudiest ones. Near Juneau and along the southeast coast, the sea temperature is similar to that of Anchorage and the south coast. While down to a certain latitude, precipitation occurs in the form of snow for many months, so much so that snow accumulation can be remarkable, in the southernmost part it often occurs in the form of rain even in winter. In Ketchikan, the southernmost city of Alaska, precipitation amounts to almost 4 meters (13 feet) per year. The wettest month is October, with up to 565 mm (22 inches) of rain, while there's a relative minimum in June and July when, however, rainfall is still about 190 mm (7.5 in) per month. Snow usually falls from November to March and totals "only" 1 meter (40 inches) per year, which is certainly not much compared to the huge amount of precipitation that occurs in the cold half of the year. Here is the average precipitation. The average temperature in Ketchikan is 1 °C (33.5 °F) in January and 14.5 °C (58.5 °F) in August. Here are the average temperatures. As you might expect, given the large number of rainy days, in Ketchikan the sun does not shine very often. In general, the best season to visit Alaska is summer, from June to August. It's cold along the northern and north-western coast, but at least the temperature is above freezing. It's very cool on the remaining western coasts and on the islands, with a daily average around 10 °C (50 °F). In inland areas, it's mild to warm during the day, and sometimes even hot, but at night it gets cool, and sometimes even cold. On the southern coast, where cities like Anchorage and Juneau are located, the air is mild, but if you take a boat trip (maybe to spot orcas and whales) or if you want to visit a glacier you must be equipped for the cold. June is the best month in most of the country, except on the north coast, in fact, it's just cooler than July and August, but the sun shines more often, and rainy days occur more rarely. However, on the north coast, where normally it doesn't rain much, in July and August you can take advantage of a temperature a little higher (see the averages of Barrow). It is worth while to recall that in Alaska the summer declines pretty quickly, so in July it usually rains more than in June, and in August more than in July. During the thaw (April in the south, May in inland areas, June on the northern coast), when snow turns into mud, it can be difficult to travel outside of towns and cities. If you want to visit Alaska in its winter appearance, February and March are preferable to December and January because the days are longer, in addition, these months are usually quite sunny in the central and northern regions. In winter, it is necessary to bring clothing for extreme cold conditions, especially for the interior region, such as synthetic thermal long underwear, a fleece or synchilla, a down filled parka with insulated hood, a wind jacket in Goretex, warm boots, hand and foot warmers, gloves, fleece socks. For the south-east, you can bring less heavy clothes, a sweater, a down jacket, a rain jacket or umbrella. In summer, bring clothes for spring and autumn, a T-shirt for hot days, and a jacket and a sweater for the evening. When going to the north or the mountains, on a boat trip or on a glacier hike, you can bring warm clothes, a rain jacket, and a down jacket.